Brown ground beef and drain. Add taco seasoning to the ground beef according to the package directions. Unroll crescent rolls into rectangles. Place in ungreased 11 1/2 inch x 16 1/2 inch jelly roll pan or cookie sheet. Press dough over the bottom and 1/2 inch up sides to form crust. Bake at 375 oven for 11 to 13 minutes or just until golden brown. Microwave beans in a microwave safe bowl for 1 minute. Carefully spread beans over warm crust creating a thin layer. 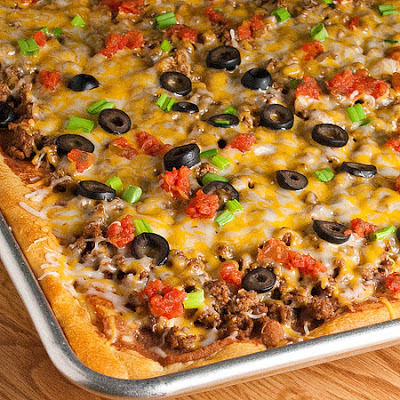 Top with cooked beef mixture, sprinkle with cheese followed by tomatoes, black olives and green onion. Return to oven for 3-6 more minutes until cheese is melted. Serve immediately. Makes 12 main dish servings or 48 appetizers.